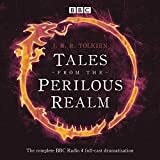 Michael Hordern narrates five full-cast radio dramatizations of stories by J. R. R. Tolkien. The stories are "Farmer Giles of Ham," "Smith of Wooton Major," "The Adventures of Tom Bombadil," and "Leaf by Niggle." Among the supporting cast are Nigel Planer, Ian Hogg, Sorcha Cusack, Paul Copley, James Grout, Brian Blessed, and Stephen Thorne. Also included in this Special Edition is J. R. R. Tolkien: An Audio Portrait, featuring radio and TV archive material from the 1960s and 1970s. Includes interviews with J. R. R. Tolkien in which he talks about The Lord of the Rings, his other Hobbiton books, life as an academic, correspondence received from fans, and his views on the 20th century. Unabridged. J. R. R. Tolkien is the author of The Hobbit, The Lord of the Rings, and The Silmarillion.